The Major Mitchell Monument is located in a small park on the north east corner of Turnbull and Henty Streets in Coleraine. The memorial takes the form of a tapering cairn constructed from local rough faced volcanic stone. The memorial stands 2.5m high and is 1.1m square at the base. 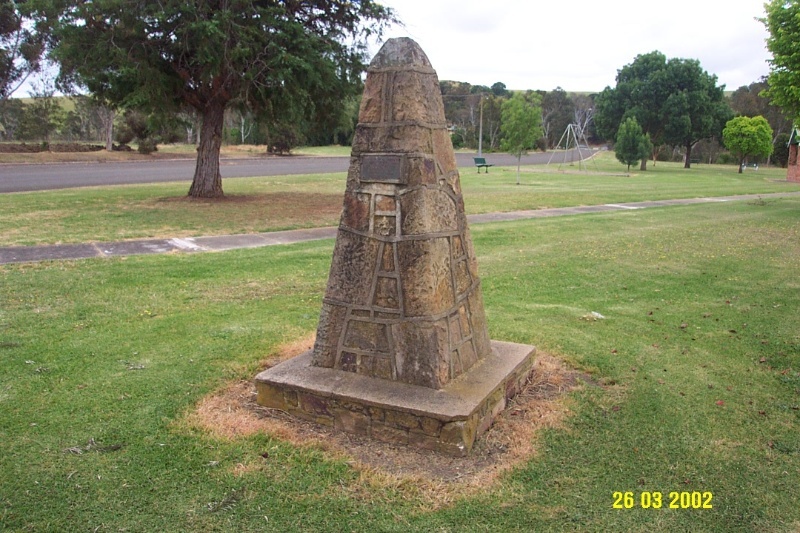 The cairn is set on a low plinth of stone and concrete, and has a bronze plaque which reads "Major Mitchell Centenary/ Major Mitchell Passed through/This District August 1836/Erected by the Public of/ The Shire of Wannon/ 7th August 1936. Major Mitchell passed nearby this place at the beginning of August 1836, following the Glenelg River downstream. He stated in his journal "The country on its banks was, as far as I could see, the finest imaginable, either for sheep and cattle or for cultivation". Monuments and memorials to commemorate Major Mitchell's epic 1836 journey can be found in many locations throughout south western Victoria. The Major crossed Victoria's northern and western plains, found a European settlement already established at Portland, and returned to New South Wales to give a glowing account of the rich land of 'Australia Felix'. One hundred years later, local communities at points along his former route engaged enthusiastically in a bout of centennial monument building. After war memorials, the Mitchell monuments are the most common form of public commemoration in the region. The Major Mitchell Monument, Turnbull Street, Coleraine is of historical significance to the township of Coleraine and the Southern Grampians Shire. The Major Mitchell Monument in the Turnbull Street Reserve is in fair condition. The frame surrounding the bronze plaque is damaged. The peak of the coping stone is missing. The memorial is constructed from a local volcanic stone and takes the common form of a tapering cairn or crude obelisk which is 2.5m high and 1.1m square at the base. The stone is roughly faced and is dressed to a rock-face finish. A single pyramidal stone is set on the top to complete the cairn. It is set on a low plinth of stone and concrete. 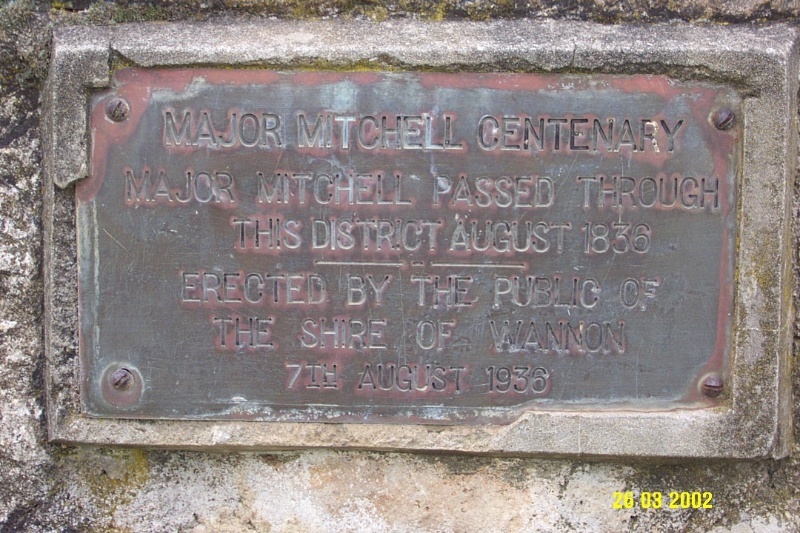 The cairn has a bronze plaque mounted on it which reads: "Major Mitchell Centenary/ Major Mitchell Passed through/This District August 1836/Erected By The Public of/ The Shire of Wannon/ 7th August 1936.